Here’s a sample /etc/netplan config for Ubuntu 18.04. HUGE LIFE PRO TIP: against all expectations of decency, netplan refuses to function if you don’t indent everything exactly the way it likes it and returns incomprehensible wharrgarbl errors like “mapping values are not allowed in this context, line 17, column 15” if you, for example, have a single extra space somewhere in the config. If for any reason you have trouble reading this exact spacing, the rule is two spaces for each level of indent. So the v in “version” should line up under the t in “network”, the d in “dhcp4” should line up under the o in “eno1”, and so forth. PSA to anyone who bought a new 10T or 12T drive and can’t figure out why the damn thing won’t power on: the SATA power standard changed. The 3.3v rail is now used to command a new-spec drive to spin down – which means that an old-style SATA power supply will never allow one of the newer spec drives to spin up. I discovered this the hard way with two new HGST 10TB NAS drives this afternoon. I wondered why such shiny big drives shipped with molex->SATA power adapters… and now I know. To get newer drives to spin up on older SATA PSUs, remove the 3.3V rail from the plug. 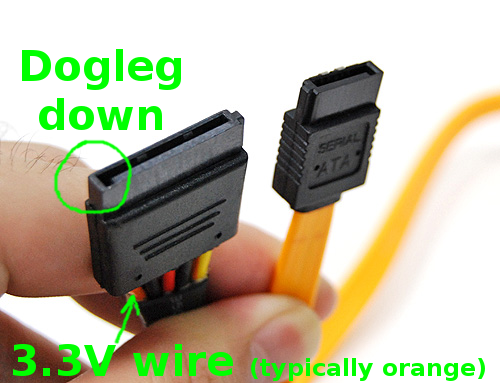 It’s the wire on the “dogleg down” side of the SATA power plug, and is typically orange in color. From what I’ve read online, no production hard drive prior to the SATA standard change actually used that 3.3V rail for anything, so it should also be safe to power older drives (and backplanes) with the 3.3V rail forcibly removed. I can confirm that my HGST 10TB NAS drives worked after removing the orange rail as shown; and the WD 2TB Black drives that they are replacing also worked fine without the 3.3V rail; I successfully booted the system on one of them after removing the 3.3V as shown, with no apparent problems whatsoever. I am expressly providing this information with NO WARRANTY; if your drives or backplane stops working / your cat gets pregnant / a republican congress is elected after you remove the 3.3V rail from a SATA adapter, that’s your problem not mine. With that said, this worked great for me, saved me from having to use one of those crappy little firetrap molex adapters, and does not seem to cause any issues whatsoever with either newer or older drives. When mixing ZFS and KVM, should you put your virtual machine images on ZVOLs, or on .qcow2 files on plain datasets? It’s a topic that pops up a lot, usually with a ton of people weighing in on performance without having actually done any testing. My old benchmarks are getting a little long in the tooth, so here’s an fio random write run with 4K blocksize, done on both a .qcow2 on a dataset, and a zvol. So, 50.5 MB/sec (zvol) vs 45.8 MB/sec (qcow2). Yes, there’s a difference; at least on the most punishing I/O workloads. Is it perceptible enough to matter? Probably not, for most use cases, given the benefits in ease of management and maintenance for .qcow2 on datasets. QCOW2 are easier to provision, you don’t have to worry about refreservation keeping you from taking snapshots, they’re not significantly more difficult to mount offline (modprobe nbd ; qemu-nbd -c /dev/nbd0 /path/to/image.qcow2 ; mount -oro /mnt/image /dev/nbd0 or similar); and probably the most importantly, filling the underlying storage beneath a qcow2 won’t crash the guest. I found out yesterday that you can tune the underlying cluster size of the .qcow2 format. Creating a new .qcow2 file tuned to use 8K clusters – matching our 8K recordsize, and the 8K underlying hardware blocksize of the Samsung 850 Pro drives in our vdev – produced tremendously better results. With the tuned qcow2, we more than tripled the performance of the zvol – going from 50.5 MB/sec (zvol) to 170 MB/sec (8K tuned qcow2)! If you fill the underlying pool with a guest that’s using a zvol for its storage, the filesystem in the guest will panic. From the guest’s perspective, this is a hardware I/O error, and the guest and/or its apps which use that virtual disk will crash, leaving it in an unknown and possibly corrput state. If the guest uses a .qcow2 file on a dataset for storage, the same problem is handled much more safely. When writes become unavailable on host storage, the guest will be automatically paused by libvirt. This gives you a chance to free up space, then virsh resume the guest. The net effect is that the guest and its apps never realize there was ever a problem in the first place. Any pending writes complete automatically and without error once you’ve cleared the host storage problem and resumed the guest. It may also be worth noting that the guest seems a little less clued in with what’s going on with its storage when using the zvol. I specified --ioengine=sync for these test runs, which should – repeat, should – have made the also-specified parameter end_fsync=1 irrelevant, since all writes were supposed to be synchronous. This strikes me as pretty disturbing; you could end up in a world of hurt if you’re expecting your host to honor the guest’s synchronous writes when, in fact, it’s not. Well, hrm. Realizing now that zvol storage doesn’t actually honor synchronous write requests very well, what if we use the libaio (native Linux asynchronous I/O) engine instead? And there you have it – qcow2 at 164MB/sec vs zvol at 139 MB/sec. So when using asynchronous I/O, the qcow2-backed virtual disk actually finished the fio run faster than the zvol-backed disk. What if we tune the .qcow2 for 8K cluster size, like we did above in the synchronous write test? For me, it’s a no-brainer: qcow2 files are only slightly slower on even the most punishing I/O workloads under default, untuned configuration, while being MUCH easier to manage, and arguably safer (won’t crash the guest if the host fills up the storage, honors sync write requests more predictably). And if you take the time to tune the .qcow2 on creation, they actually outperform the zvol. Winner: .qcow2. One of my pet peeves is people talking about zfs “striping” writes across a pool. It doesn’t help any that zfs core developers use this terminology too – but it’s sloppy and not really correct. ZFS distributes writes among all the vdevs in a pool. If your vdevs all have the same amount of free space available, this will resemble a simple striping action closely enough. But if you have different amounts of free space on different vdevs – either due to disks of different sizes, or vdevs which have been added to an existing pool – you’ll get more blocks written to the drives which have more free space available. This came into contention on Reddit recently, when one senior sysadmin stated that a zpool queues the next write to the disk which responds with the least latency. This statement did not match with my experience, which is that a zpool binds on the performance of the slowest vdev, period. So, I tested, by creating a test pool with sparse images of mismatched sizes, stored side-by-side on the same backing SSD (which largely eliminates questions of latency). OK, we’ve now got a 2.5 GB pool, with vdevs of 512M and 2G, and pretty much guaranteed equal latency between the two of them. What happens when we write some data to it? OK. What if we put one 512M image on SSD, and one 512M image on much slower rust? Will the pool distribute more of the writes to the much faster SSD? Nope. Once again, zfs distributes the writes according to the amount of free space available – even when this causes performance to bind *severely* on the slowest vdev in the pool. You should expect to see this happening if you have a vdev with failing hardware, as well – if any one disk is throwing massive latency instead of just returning errors, your entire pool will as well, until the deranged disk has been removed. You can usually spot this sort of problem using iotop – all of the disks in your pool will have roughly the same throughput in MB/sec (assuming they’ve got equivalent amounts of free space left! ), but your problem disk will show a much higher %UTIL than the rest. Fault that slow disk, and your pool performance returns to normal.